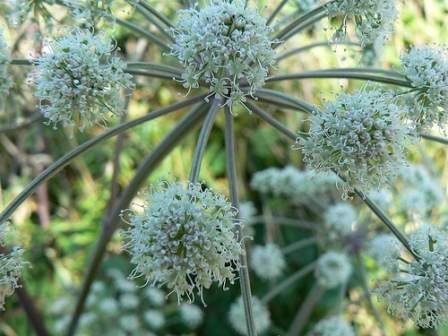 Angelica herb is a very tall ornamental plant reaching heights of four to six feet. It is a biennial plant found mostly in the Eastern United States and eastern provinces of Canada such as Ontario and Newfoundland. It loves to grow in shady, sometimes boggy area such as bottomland. Look for it also in cooler shady moist forests and by the banks of streams. The plant itself has a purple hollow stem about 2 inches around with dark green leaves, each of which are divided into 3 serrated leaflets. Mother nature allowed it to have curved inward leaves which serve to capture water. They are almost bowl shaped. The flowers are small, yellow to whitish and are grouped in large umbels. Flowers bloom in July and are then followed by oblong fruits. The roots are branched and very thick, usually up to 6 inches long with which rootlets. This plant has been around for ages, and I do mean ages! Legend has it that the plant was revealed in a dream during the Middle Ages, as a cure for the plague. This is the source of the name, derived from Archangel. Apparently in early America, certain tribes of Native Americans would use a wash of the ground up roots as a method to remove evil spirits and ghosts from a home. This plant has long been a remedy for colicy gas, sour stomach and hearburn. It does this by relieving spasms of the bowels and stomach. Used extensively in herbal medicines, it contains valeric acid, bolatile oils, safrole, linoleic acid, angelic acid and angelicin. It is also used for colds and fevers. Because angelica herb is also a good to add to treatments for lung diseases, coughs, colds and fevers, it is found in many Chinese herbal combinations. Regarding cardiovascular disease, this herb is beneficial for high blood pressure. Of the fifteen compounds in angelica, several of them perform like calcium channel blockers, which is a class of drugs commonly used to treat hypertension. Usually an infusion or tea is made from the root, stems and seeds. When used as a facial wash it can prevent acne. The dried root can be made into a powder which works well for athlete's foot as it functions as a fungicide. NEVER eat the fresh root! It is poisonous. Angelica herb is a very strong emmenagogue (huh? ), which is a substance that can induce menstruation. Therefore it should NOT be taken when pregnant. Diabetics should avoid it also as it may cause weakness, a common problem with diabetes. It may also increase sensitivity to the sun (photosensitivity) and result in sunburn. In addition to being an emmenagogue, it also induces diaphoresis or excessive sweating. It can be sedative so do not mix with other herbs or medications that cause sedation (Valarian is a good example. ).